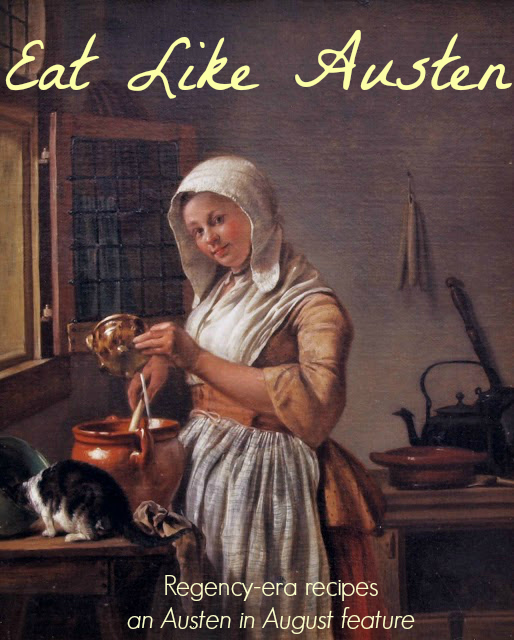 The Book Rat: Austen Eats: Modern & Regency Recipes for White Soup | guest post from Beth! Austen Eats: Modern & Regency Recipes for White Soup | guest post from Beth! Beth -- she of the fairytale-themed recipes and the literary makeup line -- will be joining us for a number of diverse and fun Janeite posts this AIA. The first of them is this look at the infamous "white soup," featured in innumerable ball scenes (that will never not sound strange...) and family dinner parties. Beth will be walking us through how to make both traditional and modern versions, and I have to say, having always thought of white soup as some bland and fussy thing, it sounds surprisingly simple but tasty! We'll be seeing more of Beth soon, but make sure to check out her blog during AIA for more Jane Austen goodness! "As for the ball, it is quite a settled thing; and as soon as Nicholls has made white soup enough, I shall send round my cards." What exactly is white soup? A staple of balls during the Georgian and Regency period, it's basically a creamy chicken soup. "Put a knuckle of veal into six quarts of water, with a large fowl, and a pound of lean bacon; half a pound of rice, two anchovies, a few peppercorns,a bundle of sweet herbs, two or three onion, and three or four heads of celery cut in slices. Stew them all together, till the soup be as strong as you would have it, and strain it through a hair sieve into a clean earthen pot. Having let it stand all night, the next day take off the scum, and pour it clear off into a tossing-pan. Put in half a pound of Jordan almonds beat fine, boil it a little, and run it through a lawn sieve. Then put in a pint of cream, and the yolk of an egg, and send it up hot." It's a stock-based soup, thus filling and fortifying. And with its chicken base, it's in the "new" French style (previously, the English were heavy eaters of beef and game exclusively), which is partly why it was so en vogue at balls. I also assume easy to make in large batches and serve attractively in tureens. I've simplified it a bit (how many of us have a knuckle of veal at the ready??) by using pre-made stock and cut chicken (added back in) instead of a whole fowl (removed from the final dish). However, if you want to make it more historically accurate, see the recipe note at the bottom of this post! 1. Warm the beef stock over medium heat, adding the salt. 2. Cook the chicken in a pan (with a bit of oil in it) over medium-high heat for about 5 minutes per side. 3. Remove the chicken from the pan and let cool on a plate. 4. Turn the heat under the pan off, and add the almond flour/meal to the pan, stirring until it absorbs the leftover grease/oil. 5. Add the almond meal to the broth and turn it to low heat. 6. Shred the cooled chicken, adding the meat to the soup. 7. Add the cream and egg yolk to the soup, stirring until combined. 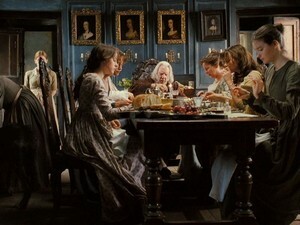 Want to make it exactly as Bingley's cook would have? 1. In a large pot, layer the knuckle bones, chicken (breast-side down), and ham. Then toss all the rest of the ingredients in there. 3. Strain everything through a sieve into a large, clean pot. 4. Let it cool overnight. A layer of jelly will form on the top (the gelatin from the bones). 5. Skim the jelly off into a pan set over medium-high heat. 6. When the jelly is melted, add the almond flour/meal and beat until combined. 7. Strain this mixture through cheesecloth, into the stock. 8. Warm the stock gently over medium-low heat. 9. Just before serving, whisk in the cream and egg yolk. Your end result should be smooth and creamy, with no chunks. Bonus: the rice will be cooked and flavored, ready to serve in its own right. Same with the ham and chicken (which won't be very flavorful after this treatment, so put them in dishes whose primary flavor comes from a sauce or seasonings). Toss the anchovies, onions, celery and bones to the pigs. 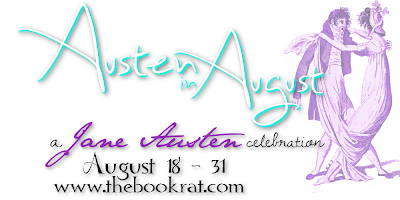 Keep an eye out for a second Eat Like Austen post, coming next week, as well as some other goodies from Beth throughout Austen in August! Now your modified recipe is doable and sounds pretty good and hearty, Beth. However, the original makes sense out of that Austen quote. I always wondered why the soup took so long when I read the story. Thanks, Sophia! It definitely sounds like an undertaking (and the kind of thing you make in bulk! ), and takes a couple of days...assuming you already have all the ingredients. The recipe sounds delicious. I enjoy reading the original version, but tend to make the modern version (no surprise there, I am sure). White poultry recipe is an popular Indian, Bangladeshi and Pakistani dish composed of roasted chicken prepared with cheese, spices and cream which is called as white poultry recipe. I try this recipe in my residence kitchen, this is quite easy and very flavorful in style.Try this white chicken recipe pakistani, this is quite easy to make at your home kitchen.